November 4 was a day in which two organizations, which have a lot in common, both lost big: the Republican Party and al Qaeda. Both organizations support restrictions on individual liberty and imposing fundamentalist religious views on others. Both depended upon each other. The Republicans would have been thrown out of office a few years earlier if not for capitalizing on fear of terrorism, and al Qaeda would be in far worse shape if not for the foreign policies of George Bush. The Republicans cared far more about using fear of terrorism for political benefit and to pursue their foreign policy goals than to actually do anything about terrorism. Bush enabled al Qaeda to accomplish one of their major goals–to see the end of one of the secular governments in the region–along with greatly assisting al Qaeda with recruitment. In attacking the wrong country after the 9/11 attacks, Bush also enabled al Qaeda to survive in Afghanistan. While it’s a bit irritating to have an atavistic mass murderer presume to dictate appropriate politics for a black American, Zawahiri’s diatribe is good news. In fact, it may be the best news we’ve gotten in the struggle against al-Qaida since the so-called Sunni awakening in Iraq. Zawahiri and his fellow jihadists are clearly worried both about the symbolic power of an Obama presidency and about the smarter strategy against terrorism that Obama has laid out. The hamfisted tactics favored by George W. Bush, including his ill-fated invasion of Iraq, were a gift to al-Qaida and its recruiting efforts. They allowed bin Laden and Zawahiri to paint the U.S. government as an imperial power bent on a 21st-century crusade against Islam. However, that’s a more difficult argument to make when the Oval Office is occupied by a black man whose Kenyan grandfather was Muslim and who played with Muslim friends during his childhood years in Indonesia. The president-elect has also promised to restore the nation’s moral authority by returning to its fundamental values, starting with shutting the prison at Guantanamo Bay. That facility was never necessary for national security; the U.S. has prisons on continental soil that can secure dangerous suspects. But the Bush administration wanted an off-shore location where it could employ hideous methods of interrogation and isolation away from the prying eyes of the media and human rights officials. We Americans believe ourselves to be a force for good in the world, but the Bush administration’s wholesale detentions and widespread use of torture badly tarnished our reputation. That matters in the fight against jihadists, who win converts by convincing alienated young Muslim men (and, increasingly, women) that America is their enemy. The toppling of Saddam Hussein, who had nothing to do with Sept. 11; the abuses at Abu Ghraib; the quest for permanent bases in Iraq — all those gave credence to al-Qaida’s claims. Obama is far from naive about the threat represented by Islamist terrorists. The president-elect has promised to step up efforts to hunt down bin Laden and his Taliban sympathizers, the terrorists responsible for the Sept. 11 attacks. He also understands that we’ve wasted several years — not to mention billions in resources and the nation’s good name — in a diversion from that war. During the campaign, several of John McCain’s supporters — including the recently forgiven Joe Lieberman — tried to argue that an Obama win would be a victory for terrorists. The neocons hyperventilated over Obama’s promise to draw down troops from Iraq, to talk to our enemies, to restore the rule of law. Even Obama’s correct pronunciation of Pakistan (Pah-kis-tahn) became something to snicker about, as if it were a sign of weakness. Al-Qaida’s cheap taunts, on the other hand, suggest its minions see something to fear in the new president. They know he’ll fight both the propaganda war and the shooting war a lot better than Bush ever did. The New York Times writes that Hillary Clinton will accept an offer to be Secretary of State. The good news is that this will get her out of domestic policy. The bad news is that she will have a voice in foreign policy. Clinton herself isn’t so much the problem, they say. It’s the loyalists and traditional thinkers Clinton is likely to bring into the State Dept. if she becomes secretary. The dispute is only partly ideological in nature. While the coterie of foreign-policy thinkers around Obama have been more liberal, in an aggregate sense — on issues like Iraq and negotiations with America’s adversaries — the Obama loyalists question the boldness of the Clintonites. 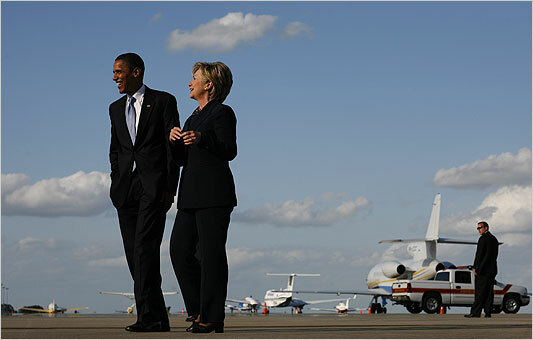 They fear that Obama’s apparent embrace of Clinton represents an acquiescence to the conventional Democratic foreign-policy approaches that they once derided as courting disaster. Some wonder whether a Clinton-run State Dept. will hire progressive Obama partisans after an acrimonious primary. In addition, some Obama loyalists wonder whether the same people who attacked Obama on foreign policy during the primaries can implement Obama’s agenda from State Dept. perches. “Look, Clinton and Obama are both smart people,” said one Democratic official who would not speak for the record, “and I’m sure their one-on-one relationship would be OK. But when you hire a Clinton, you hire more than just that one person, you get the entire package.” If Clinton becomes secretary of state, it’s possible that the fissures between her loyalists and Obama’s would be a significant undercurrent of the administration’s foreign-policy decision-making. There are significant ideological differences between the Obama and Clinton people, plus one of the key Obama people called Hillary Clinton a monster, probably disqualifying her from a job at the State Department. There is an ideological component as well — though it is more complicated than either side typically admits. During the Democratic primaries, the Clinton campaign attracted more familiar Democratic faces from the foreign-policy community — the people derided by the liberal blogosphere as self-styled Very Serious People — who tended to be less progressive than their counterparts in the Obama campaign. The foreign-policy wing of the Obama campaign, during the primaries, considered itself as a force for redressing the timidity of the traditional Democratic foreign-policy community that acquiesced to disasters like the Iraq war. Some Obama loyalists pointed to a 2007 memo written by Harvard’s Samantha Power — a former leading Obama adviser who resigned from the campaign after making an untoward remark about Clinton — that summarized the Obama campaign’s ideological meta-critique of many of the people who might staff a Clinton-run State Dept. Titled “Conventional Wisdom vs. the Change We Need,” the campaign released Power’s memo to the press after the Clinton campaign labeled Obama naive for proposing negotiations with dictators without preconditions; for ruling out the use of nuclear weapons on terrorist training camps; and for proposing highly-conditioned military strikes in Pakistan against senior Al Qaeda operatives.